‘This is Dubstep Anthems’ features 30 of the genre’s top tracks in a collection featuring the likes of Skream, Chase & Status, Burial, Nero, Skrillex, Benga & Coki, Flux Pavilion, Pinch, Foreign Beggars, Noisia, Sub Focus, Caspa, Doctor P and many more. From its humble Croydon roots to its current state of global popularity, dubstep has been identified by, and indeed uplifted, every bass loving group, body and cause on the dancefloor. 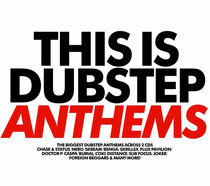 From the premier league producers who really pushed dubstep to its musical limits, ‘This Is Dubstep Anthems’ is a powerful release. Top tracks include Skream’s remix of La Roux’s ‘In For The Kill’, Nero’s No.1 hitting single, ‘Promises’, Doctor P’s ‘Sweet Shop’, Chase & Status’ breakthrough cut ‘Eastern Jam’, Benga & Coki’s ‘Night’ and Caspa’s remix of TC’s ‘Where’s My Money?’ Elsewhere across the double CD/mix collection are tracks such as Skream’s classic ‘Midnight Request Line’, Flux Pavilion’s ‘Bass Cannon’, 16Bit’s remix of Noisia’s ‘Machine Gun’, Burial’s take on Commix’s ‘Be True’ and loads more. It’s out August 4.